Are you looking to keep your posture up and straight? Looking to fix hunchback postures but don’t know where to start? Or maybe in your situation, you’re always asking the question “Can you fix a hunchback posture if you’ve had it for years? If this describes you, you’re in luck. We’re going to provide you with a comprehensive article and pc muscle exercises video library so you can get the right exercises to improve posture and video examples to begin your own custom program immediately. This article is broken down into the most common questions we get. We divided them into sections in no particular order. You can go through our table of contents and find out which section best applies to you. Whether you’re learning how to fix a hunchback with exercises, or how to fix humpback curves by maintaining a proper posture, the key is to be consistent. I’ve seen too many people begin a program and give up after a week or 2 because they weren’t seeing great results. Be patient and realize that you’ve most likely have been in this bad position for years. Developing the proper exercise habit will slowly help you learn how to fix hunchback posture problems. One of the most common positions in which we develop aches and pains is from sitting for too long. If you want an easy and quick way to start doing exercises while you are sitting, starting off with a Brueggers exercise may be the best option. 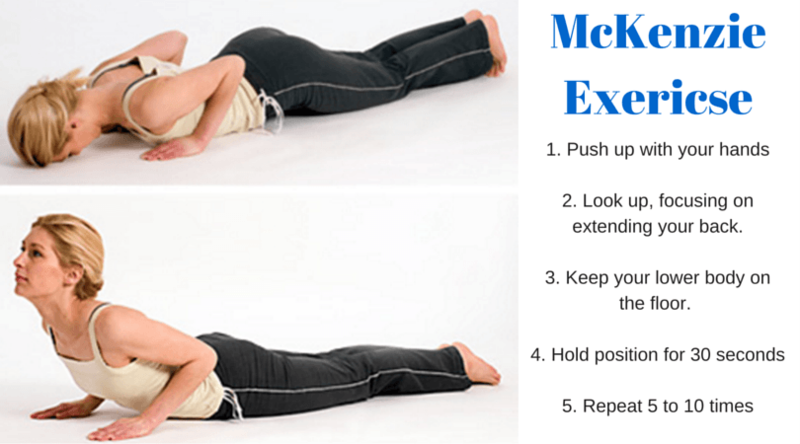 Another great general exercise that you can do are called McKenzie Extension Exercises. Simply lie on the floor and then bring your upper body up by pressing your hands into the ground to lift your upper body up. Keep your head up as you begin to extend your upper back. Make sure you contract the mid back and postural muscles in addition to extending the middle back to fix hunchback posture position that you’re probably staying in for hours a day. A hunched back posture also comes with the rounded shoulders. In the video above, we discussed how stretching the rotator cuff muscles is the LAST thing you want to do. Avoid it altogether. You see, by keeping your shoulders rounded forward, you’re actually STRETCHING the shoulder rotator cuff muscles. Doing stretches for them is not how to correct hunchback posture positions. These stretching exercises to improve posture may be making the matter worse. That’s why STRENGTHENING the rotator cuff muscles is more effective. This, in addition to stretching the chest muscles, will attempt to fix the rounded shoulders that are associated with a humpback posture. If you’re sitting at your desk, there’s a simple way to offset the rounded shoulders. One of the biggest myths is that the bad posture will lead to pain. This is not true at all. There are some people with bad posture who never get back, while there are those that have great posture that are always in pain. However, it’s the fact that you sit in one position over a period of time that can lead to pain and discomfort. Whether its a bad posture or not is not the case. That’s why it’s important to continue taking frequent breaks. You may be saying ‘I want to know how to fix my hunchback’. What I’m saying is that frequent breaks will produce the goal of getting less pain and discomfort. The hunchback itself will take longer. For rounded shoulders, use a timer at your desk. Every hour, it will remind you to sit and simply roll back your shoulders and then let them drop down. That’s how easy it is. The secret is to take frequent breaks to do this. I would initially put the timer to every 20 minutes. By doing it more frequently, you’re developing the habit of always bringing your shoulders back and dropping them. Over time, this will be an automatic reflex. In this section, we’re going to discuss and show forward head posture exercises. This type of position is often associated with the hunchback position and can most often be seen when we’re sitting at a desk all day. I like to provide exercises for forward head posture that you can do while you’re sitting at your desk or any other time during the day. These will be the forward head posture exercise instructions that can be done anywhere, conveniently and in quick time. It’s all about taking baby steps on your way to reducing any pain or discomfort with exercises to improve posture. If you try to correct forward head posture by going overboard with your exercises, you may give up easily. That’s why you need to start with things you can do at your desk. Do that for about 2 weeks. If you find yourself developing a habit and can stay on schedule, then you can add exercises that you can do when you’re at home and that require you to be in positions such as lying down. One of the biggest things I see people doing wrong is sticking to the area where they are looking to correct. This is the wrong way to look at it. You’ll start seeing that a pain in the neck may require exercises for other body parts that are not anywhere close to the neck. For example, someone that may having a bad posture from standing may even require exercises for fallen arches! Treat the body as a whole rather than separate parts. You’ll also see that that exercises for hunchback posture are very similar to the video above. Learning how to correct hunchback posture, or slouching posture as some like to call it, may overlap with forward neck posture exercises. Especially with posture, there is going to be quite a bit of overlap. That’s because a forward head posture correction will also impact for anyone that wants to learn how to straighten a hunched back. You’ll also see different names for some of these conditions and postures. For example, kyphotic posture exercises mean the same thing as hunchback exercises. All the exercises for hunched back positions that lead to a slouched posture can also be used to fix rounded shoulders. The body is interconnected. That’s why you want to gradually go from specific exercises to improve posture to what your needs are, such as how to correct rounded shoulders, to developing a wholistic approach for a full body stretching and strengthening program. 1. Walking posture can be offset by carrying heavy bags or backpacks on one side of the body. This can lead to an abnormal curve in the middle back, making muscles on one side overstretched while over working muscles on the other side. 3. Having a neck that sticks out while walking can also be due to staying in this position for a long time while sitting. Some people continue with this habit while walking. The reason is that certain muscles in the neck get tight, while other muscles get weak or ‘inhibited’. You need to learn how to correct posture neck muscles by activating certain muscles and stretching others. Strengthening exercises appear to provide better results. Most people believe that stretching would be helpful, but in reality, strengthening addresses the muscles that may be overlooked. Want to learn how to strengthen the neck muscles? The neck strengthening video just above shows you 4 different exercises that you can perform. When walking straight, try to keep your chest up and out. Rather than focusing on the correct posture, the simple act of focusing on your chest will help correct the rest of the posture. This is a lot easier to remember than trying to remember keeping your shoulders back, head up and hips in. You may have heard of people using a book to balance on their head to get correct posture. This is something that we all see, yet we never try it ourselves. Give it a try for a week or 2 and you’ll be amazed at how much more you become aware of your own standing posture. Having a straight posture can also be addressed by wearing proper footwear. It’s important to see a foot doctor to assess whether you have pronated feet, a condition where your arches fall flat and your feet rotate inwards when you walk. This can change the alignment in your feet, which can then work it’s way up to your spine and higher, leading to an altered posture. Which posture exercise is the best to do? So far, we’ve gone through some great exercises for kyphosis posture issues, in addition to learning how to correct neck posture with forward neck posture exercises. You also learned a great rounded shoulders fix with some exercises to improve rounded shoulders. These exercises for hunched shoulders are very similar to the postural strengthening exercises you need to do for the neck and low back. You also learned that scapular exercises can affect a hunchback neck and is also considered one of the exercises to correct rounded shoulders. When it comes to postural exercises, there aren’t any specific exercises to improve posture that are going to solve everything. It needs to be a complete program. That’s why I’ve included a list of all the exercises that you can do for postural issues. The big question I always get is ‘can posture exercises help with pain?’ As I’ve said already, having ‘bad posture’ doesn’t necessarily mean you’re going to develop pain. There’s a lot of people walking around with bad posture that don’t have any pain. There are others with perfect posture that have unbearable pain. 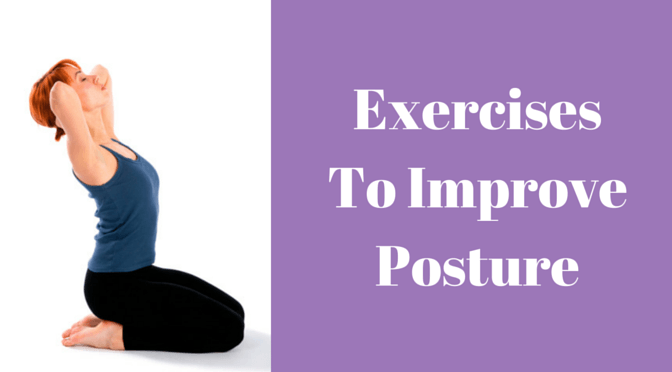 The key is focus on exercises to improve posture that you can do regularly. Over time, your muscles will respond by getting stronger and having more endurance. That’s why exercises are so important. It may take some time but it will be effective in helping to reduce any pain and discomfort. For example, I give bulging disc back exercises to patients that have a disc problem in their low back. But I don’t just stop there. They also learn to correct rounded shoulders posture, and the exercises to correct male posture are the same as for females. In addition to strengthening the low back, we’re providing exercises for the neck, shoulders, especially for exercises for posture. Pull shoulders back and the low back pain improves. There are many other conditions where our focus is not only on that specific condition, but on full posture care. Even for torn meniscus rehab exercises, we add postural kyphosis exercises and sometimes recommend a back posture corrector to maintain a long term posture fix. In summary, there’s a core number of exercises you can perform, but there isn’t one exercise that is better than others. They work together to provide a body wide effect. If you’ve been doing exercises and not seeing the results you want, it’s time to work towards a full body exercise program. 1. I usually recommend addressing the easiest area to begin with. For example, learning how to straighten rounded shoulders can be performed easily and without any discomfort. It can be performed standing or sitting. The exercises are similar to the typical shoulder posture exercise. Simply bring your shoulders up and back, and then let them drop. Stay there for a few seconds to see how it feels. If you have any shoulder issues, make sure that this does not cause any pain in the shoulders. If it does, move on to other exercises and see your physician. 2. A forward posture in seniors can be due to lifelong structural changes in the spine. This can lead to permanent changes that may not be so easily corrected. One has to remember that performing things such as neck posture exercises to improve posture alignment may not accomplish that goal. The purpose of an exercise program is to make the muscles around the joints stronger and more flexible. It may not necessarily reverse any curves that have developed. If the goal is to learn how to fix posture fast, that may not be the case with seniors. 3. If you’re a senior and you’re asking ‘How can i fix my posture when you say that it’s not possible?’, the answer is that you need to focus on the exercises to improve posture as a long term habit. Fixing posture for the sake of getting good upright posture may not be the best way to go. In order to fix posture, it may take several months or years to slowly make any change. What you need to ask yourself instead is ‘how can I perform exercises that allow me to stay loose and pain free?’ Your exercise program’s primary goal is to make sure you’re able to be strong enough to stay in one position for a long period of time, or to be able to address any aches and pains. This doesn’t necessarily lead to a better posture, at least in the initial stages. Focus on your exercises long term. Can you fix bad posture permanently? Ever wonder if you can straighten posture, or basically fix bad posture permanently? There’s a lot of misinformation out there regarding this. Some say that you can, while others say that it’s impossible. The answer lies somewhere in between. Let me explain. As we get older, that hunched position may become more structural. That means the bones have formed in this way. That person may not be able to straighten out the curve in their back, no matter how much exercises to improve posture or treatments they get. If they continue to perform upper back posture exercises, and learn how to improve neck posture, the goal may be to improve flexibility and mobility. They may report being less stiff. However, those curves of being hunched over for life may not disappear. Now let’s take a look at someone that’s younger. Their hunchback is due to bad habits, such as sitting at the computer. To fix their upper back posture, they may simply require certain exercises, reminders and cues to improve their bad posture. If they continue with changing their lifestyle and their environment, they may be able to permanently go down the road of fixing bad posture. However, the focus is still on following the right exercise program. For those that are younger, that exercise program can help you reduce any pain and discomfort that comes from that bad posture. If you’re looking to learn how to correct bad posture in adults that are much older, the main goal may have more to do with increasing flexibility, reducing stiffness, and attempting to make sure that the bad posture curves don’t progress any further, to the point that they become debilitating. Like I said before, if you’re looking on how to fix bad posture fast, you’re going to be disappointed. Your occupation is another factor that can deal with whether you’re going to have success in making the right changes to your posture. Do you sit at work all day? Are you actually able to take frequent breaks to be able to walk around and give your posture some break from being in a static position for too long? Simply learning how to keep a straight back while sitting will not be the answer. Frequently changing positions so you’re not sitting for long periods of time is the most important factor. In fact, if you sit for an hour or longer at any one time, there’s a real chance of developing health issues. This is even if you end up going to the gym for an hour! The key is to take breaks every hour. Get up, move around. Even if it’s only for 3 to 5 minutes, that makes a significant change to your health. If you are able to do that, you’re half way there. The next part is to perform some kind of regular exercise program such as weight lifting for posture, or even taking up yoga or Pilates. The last factor that determines if you’re able to make permanent changes through a bad posture fix, is whether you actually have the motivation to learn new habits. Performing a couple of exercises and hoping for a permanent fix is not going to happen. You need to develop a consistent program, either during work, at home, or at the gym and stick with it, no matter how discouraged you may get from a lack of improvements in your posture. You didn’t develop this bad habit in one day. It’s not going to take you a few days to get rid of it. Get past the simple notion of how to keep back straight and embrace the consistent habit of exercise for long term results. Apart from doing an exercise to straighten back muscles and joints, some of my patients tend to add a back brace to correct posture, and hunched shoulders correction. These posture aids are okay to use, except you have to know when to actually use them. Some believe that their posture will immediately improve while using this. You can use a posture test to see immediate benefits. Take a picture of yourself before and after putting on a brace. Does it help you improve your posture? You may sometimes need to try different types of braces to see which one will fit you the best. Posture braces for men and women can sometimes be different in terms of size so make sure you ask if the brace size is for a man or woman. Why am I talking about posture braces in an article that deals primarily with learning how to correct bad posture through exercise? It’s because there are times that you may not see immediate benefits with exercise on poor posture correction. To correct poor posture, you need to be consistent with your exercises and let them work before you jump to using a back brace for hunched shoulders. Fixing back posture by simply using a brace is not going to solve the underlying issue. Your muscles will still be weak or tight. Your joints will still be stiff. Exercises is best way to learn how to get perfect posture results. Using a back brace can work, but should always be used WITH a good exercise program. Stretching, strengthening and mobilization exercises to fix back posture should be tried for at least 4 weeks. So next time someone asks you the question ‘how to fix my posture’?, you tell them to start with exercises first, before jumping for a quick fix such as a back brace! By now, you should note that simply correcting bad posture may not be the main goal. There’s a lot of misinformation out there that may claim that if all you do is keep your shoulders back, posture will improve instantly. In this section, I’m going to outline a complete posture workout that you can do. This workout doesn’t just focus on one area, because that one area is not going to provide a body wide change. If you follow comprehensive exercises to improve posture, you’re more likely to see gradual changes. 1. A posture workout allows you to focus on stretching tight muscles and strengthening weak muscles. 2. A workout is designed to provide movements and exercises that will begin to reduce any pain or discomfort that you may be getting in your muscles or joints. A stronger and more flexible body will be able to cope better with a bad posture and help stabilize posture support for men and women alike. 1. Posture exercises will not lead to a perfect posture. There is really no such thing as a perfect posture. The main issue with having pain from the so called bad posture is that one does not move from that position. If you want to really address pain and dysfunction from a poor posture, you need to develop a habit of getting up and keeping your muscles moving frequently, mostly every 30 to 60 minutes. In the above exercise list, I’ve decided to break up the perfect workout into three components, depending on the position you are in. I find that this works so much better because most of us are usually in one of three positions most of the time. We’re either sitting, standing or lying down. It’s also difficult for most of us (including me!) to have to switch up positions to go through all the exercises. I’m sure you’ve decided not to do an exercise because you’d have to stand up, if you’re currently lying down! So we broke it down into those three areas. For improving posture, shoulder exercises are critical to maintain flexibility and strength in the upper body. Regardless if you are working on your body posture in sitting, standing or lying down, these exercises may not fix poor posture, but they’ll gradually provide your body with the movement and blood flow that it needs. Fixing posture is what everyone wants, but in order to learn how to correct bad posture, you first need to stretch and strengthen your body. 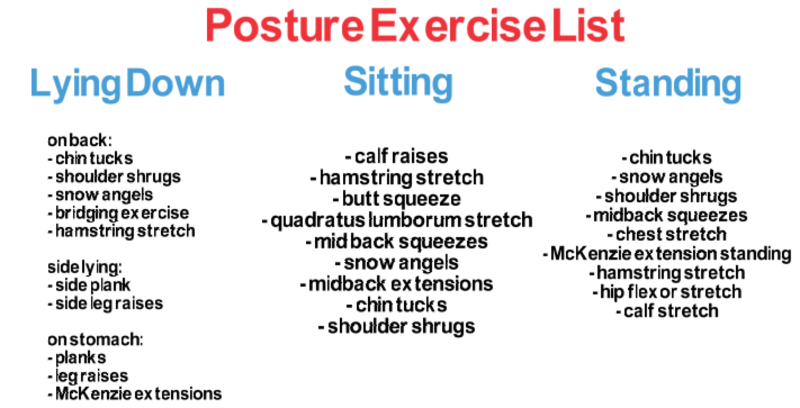 As you can see in the exercise list, exercises for rounded shoulders can also be done lying down, sitting and standing. I’ve decided to offer variations from each position. Weight lifting for better posture is not added to these exercises, mostly because that requires equipment which may not be available most of the time. We’re focusing primarily on body weight exercises that can be done anywhere and anytime. These exercises will show you not only how to fix rounded shoulders, but how to fix posture in sitting, standing or lying down. Postural correction is a slow process so you need to be consistent with your exercise program. 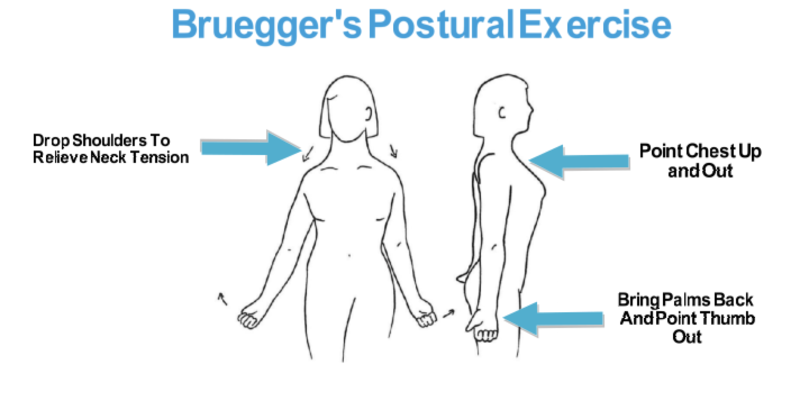 Also note that you can use additional tools to help you learn how to fix poor posture with these exercises. For middle back extension exercises, you can use our own Posture Wizard system. I’ve had great results in using the Posture Wizard to fight the slouched postures that we all have a habit of being in all day. You can say that the Posture Wizard is a sort of posture corrector for women and men. You can also use it for a flat back posture by using it over the low back. Fixing poor posture with the Posture Wizard is not just by lying down on the stretcher. It also comes with an elastic strengthening band and trigger point ball because fixing poor posture involves a combination of different treatment strategies and techniques. If you want to improve your back posture, try using the exercises in this list over several weeks. You’ll discover that certain exercises to improve posture will be easy while others appear to really hit the tight and painful spots that you may have. If that’s the case, you’ll begin to perform certain exercises for longer or with higher repetitions, or may even begin skipping some exercises or adding new ones. Whatever is the case, follow the exercises for several weeks, and then begin changing things up to personalize them to your own needs. Bad posture symptoms: Is bad posture related to pain? By now, you should have a thorough list of exercises that you can use to help with your posture. I’ve included several videos to make this article more instructional so you can take action with the recommendations that I’m providing. The posture neck exercises will help you strengthen and stretch your neck muscles. The core and back exercises can help you find ways to keep your back straight. You’ve also seen that although everyone wants to strive for the perfect posture, there really is no such thing. Posture back exercises are designed to maintain healthy muscles and joints. Fixing your posture through these exercises is just a start. Gradually over time, you want to be able to develop a healthy habit of improving your posture. In this section, I want to talk a bit about whether that bad posture is actually related to pain. Too many of my patients tell me they slouch at work, but when I ask whether that is causing any pain, they sometimes say no. There’s a lot of reasons to develop proper posture. Your bones, muscles and ligaments can be aligned to produce less stress on your body. Sitting in a slouched position all day can put a strain on your muscles and ligaments, with the possibility of leading to pain. Notice how i said ‘possibility’. That’s because there’s conflicting evidence that bad posture actually leads to pain. You may read about some experts telling you that there’s no such thing as a bad posture. They are partially correct. If you have pain from sitting for too long or in a bad position, you may want to address that. However, simply trying to correct that position isn’t going to help. Instead of focusing on fixing my posture, I focus on making sure I constantly move. Awhile ago, I came across the best description of how to address these aches and pains. They said ‘the BEST posture is the NEXT posture’. What this means is simple. If you are getting pain from being slouched over, trying to sit in ONE PERFECT posture isn’t the solution. Instead of constantly focusing on how to keep shoulders back, simply make sure that you shift positions every 30 minutes to an hour. After an hour, make sure you get up and move around. Stretch if you have to. You may want to gradually work on a proper posture, but as you can see, a proper posture isn’t even the best thing for your muscle pain. It’s the ability to constantly change positions and not sit in ONE position for any prolonged length of time. There’s no quick solution on how to improve posture fast. The simple solution is in front of you. If you are getting pain, and you’re in a bad posture, simply learn to move frequently, in addition to beginning your posture exercises, shoulders, back and all. In this section, I’m going to go over the specific shoulder exercises that you can do for your posture. There’s a reason I break this up into it’s own section. I have provided general overall exercises to do, but for some, they carry all the tension in their upper shoulders and neck. If that’s your major issue, then I recommend following the shoulder posture corrector exercises in this section. Most believe believe they can get help with posture by just bringing their shoulders back. I’m sure you may have seen information out there talking about how to keep your shoulders back, as if it will eliminate all bad side effects of bad posture. However, this is rarely the case. The main theme through this article is that your posture isn’t a local thing. It’s affected by every part of your body, from your neck all the way down to your feet. Simply bringing the shoulders back isn’t going to resolve your back posture. If simply bringing the shoulders back are not going to be that helpful, then what is? Can bad posture be corrected by these shoulder exercises? As you begin performing your shoulder exercises, try performing them at least 3 times a week, if not every day. Hold each stretch for approximately 30 seconds. You can repeat as many times as you like, making sure you repeat AT LEAST 3 times. Most of my patients wonder how long it will take to fix their posture. The shoulder exercises are not designed, by themselves, to magically improve posture. Some may end up adding a correct posture brace to their exercises, while others need to focus on good standing posture as part of their overall shoulder posture program. By working on the whole body, you’ll gradually be in a better position to maintain a proper posture. If you’re sitting, keeping a good back posture can help keep the shoulders back, as you’ve seen in the first video in this section. If you keep your back straight and your chest up, your shoulders will naturally adjust back. One of the most common piece of advice I give my patients is that they should focus on the basics that I’ve given here, and not always be looking for better posture exercises. There are dozens of them, but the goal is to be consistent with a few. Don’t over think things and give up too early. Performing exercises to straighten back muscle or shoulders are to be performed for at least 4 to 6 weeks to begin seeing a difference. By training your posture, back pain will gradually reduce over time, and not happen overnight. To permanently get rid of back pain, posture exercises are probably the most effective strategy you can use. Tired of getting exercises that have you going up, down, lying and jumping around to the point that it’s more effort to change positions than it is to actually perform your bad posture exercises? If so, you’re going to learn how to perform the right posture exercises while sitting. Sitting for long periods of time has the risk of reducing circulation. Using calf raises allows you to increase blood flow to the lower body. So how does this help you learn how to straighten back posture? Directly, it has less to do with your posture and more to do with overall general health from sitting too long. This prolonged sitting will not only lead to bad posture, aches and pains, but also will affect overall health. Although I recommend that you get up every 30 to 60 minutes, there are times that most of my patients can’t do that. That’s why I like to begin with a quick calf raise to get the blood pumping. To improve posture, exercise the entire body. Dynamic hamstring stretch – Perform 5 reps for each leg. Extend your leg for 3 to 5 seconds, hold leg up for 1 second and lower again for approximately 3 seconds. The hamstring muscle is closely connected to your back. If the hamstrings get tight, the glute (buttocks) get ‘weak’, which means they don’t activate and contract as well we’d like. This then leads to a low back that works harder to balance out the lack of activity from the glute muscles. As your low back works more, it tires out quicker. This leads to gradually developing a slouched posture. Having posture workouts that incorporate hamstring stretching will help break this pain cycle and provide more endurance and flexibility while sitting. Squeeze your buttocks for 5 seconds, relax, and repeat for a total of 5 times. In the previous section, I explained that hamstring tightness can lead to weak glutes. That’s why it’s important to squeeze the glutes as many times during the day that you can. Remember, you’re sitting on those glutes all day! Squeezing them regularly will increase blood flow to the area and get the muscles working. The QL stretch has got to be the most overlooked stretches I’ve seen. It’s also something that is done wrong nearly 90% of the time. Most people who are taught to twist their body to stretch their back quit not because it’s hard, but because they don’t find it doing anything! That’s because the quadratus lumborum (or ‘QL’ for short) is one of the most affected muscles from sitting too long. It also has several different muscle fibers that go off into different directions. If you do the stretch in only one angle or position, you’re missing out on all the other positions. This can lead to being disappointed with the exercise and quitting. In your next posture workout while sitting, incorporate this stretch. Be patient. Don’t give up because you aren’t ‘feeling anything’. It can sometimes take a couple of times to really get an idea on which muscle fibers need to be stretched. Up to now, you’re probably saying ‘I have bad posture’. When are we actually going to get to the real exercises to improve posture?! Well, as we finish with the lower body, we are now getting right into the local muscles that are causing stiffness. Squeezing the mid back muscles is similar to squeezing the glute muscles. The mid back muscles also get ‘weak’ or what we call ‘inhibited’. That’s why performing squeezes a few times a day will help keep these muscles active. Sit straight, bring your arms back at 90 degrees angle at the elbow. Pull your arms back as much as possible. Now slowly raise your arms as high as you can while keeping the arms pulled back. Slowly lower the arms until you get to slightly below the 90 degrees mark. Perform 5 slow reps.
Are you always sitting in a slouched position? Then you’ll need to learn how to extend your mid back to offset the strains you put on the muscles and ligaments all day. This exercise can be done while sitting straight. If you have a chair with a back rest that is at around the mid back area, you can use the edge of the chair as a fulcrum to extend upon. As you keep your hands in a snow angle position, squeeze your middle back and extend backwards. Repeat several times throughout the day. Have you ever noticed your shoulders shrugging as you do work? If so, have you ever been told to stretch the upper shoulder muscles and not strengthen them? This advice is often given in some workouts to fix posture. The reason given is that your shoulders are already ‘tight’. By doing shrugs, you are only making them tighter. However, they often fail to realize that there are TWO muscles in that area. One actually gets tight and develops aches and pains. This is the ‘levator scapula’. The other is the upper trapezius muscle. This muscle actually gets stronger the more you strengthen it. As you can see in the previous video, there’s a right and a wrong way to perform this exercise. Perform it the right way and you’ll begin to feel stronger in the neck area. The exercise can be demonstrated at the 1:41 mark of the previous video. Although you may be constantly trying to learn how to keep your back straight, the forward head posture associated with the neck can also lead to tight muscles in the back of the head, leading to neck pain and headaches. The video at the start of the article goes through how to properly do a chin tuck. In this case, you want to add this exercise to your sitting posture. In this article, we’ve gone through a comprehensive guide on finding exercises to help improve posture. You’ve learned how to improve your posture, how to fix hunched shoulders, and how to perform exercises while sitting, lying down and standing. I hope that you’ve been able to find the right exercises, whether its for shoulder posture, back posture, or improving strength and flexibility. If you have any other questions on exercises to improve posture, leave a comment below. tnx for your very good and complete article …. This site has been very helpful. I’m trying some of your products sold on Amazon as of receiving them yesterday. I’m positive on your exercise techniques and will let your staff and current/future customers how the process is working. Thanks for the feedback Emily! Dr. Jasper here. I hope the article was helpful in showing you a wide variety of ways to improve posture. If you have any questions about the Posture wizard or any of our other products, feel free to reach out. We like to make sure you’re using everything the proper way to get the results you want. Thanks! This is an excellent and thorough article! Thank you!